From The Era - Wednesday 10 July 1929. From The Era of 17 July, 1928. 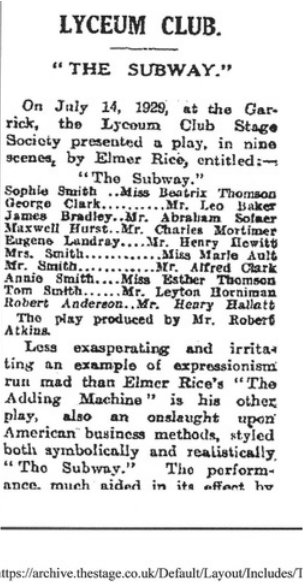 A play in nine scenes by, Elmer Rice presented by Lyceum Club Stage Society, at the Garrick Theatre, Sunday. July 14th. Mr. Elmer Rice’s new play, presented at the Garrick Theatre, on Sunday night, may have been intended to, point out the crying of wider education to stimulate the reasoning power of the classes. Or it may be taken as a tragic but typical example of the unaltered inequality the sexes. More probably, the author is considering the theme so dear to writers to-day and yesterday —the futility of the conventions of civilisation as the solution of any problem of humanity. At any rate, Mr.Rice has offered a distinctly interesting and deftly-drawn picture of life it frequently is; life, smoke -painted with the atmosphere of the city; life as it lived real people - disillusioned people selfish people —-people hidebound selfseeking, the cause of disillusionment. Engrossingly, the characters are made to think aloud as well to speak. With a refreshing disregard accepted technique, acts are forgotten, and the play consists of nine scenes, each drawn with an artistry that exceeds the last. It it hardly according to hidebound technique, for example, to introduce into one short scene four people who never appear in the play again in the play. Yet this scene, with its clear-cut conception of character, and its fascinating theme of thoughts spoken aloud. is one of the interesting in the play . There is a young, inexperienced girl, longing vaguely for companionship, hating her life with its drab office and hours spent travelling in the Subway, meeting for the first time , an interesting personality. There is this personality, an artist, a man of straw, attracted to the girl, pitying her, struggling with himself against the growing attraction. There is the studio scene, with his brain afire with splendid words vision and beauty while his conscience (expressed on the stage with an audible voice) murmurs "liar"! There is the girl overwhelmed by the new and apparent beauty of her love. There is the cynical friend, persuading, sneering, offering work abroad. And there is the artist accepting. Then there is the dream scene - a wonderful conception - with the girl, sleepless, racked by torments, doubts, regrets, assailed by phantom pointing fingers, phantom words of accusing, soft shadow words of the past, strident shadow forecasts of the future, melting visions of the wedding ring that marks the boundary between vice and virtue. And finally there is the frantic girl rushing into the Subway, finding it welcome for the first time in life because of the space on its steel rails in front of its oncoming train. Given a part deep with possibility, Miss Beatrix Thomson made a brilliant success of the young girl. Particular opportunity occurred in a movie scene, and in the dream scene, where the actress displayed the utmost of realism. As the artist whose quest for "vision and beauty" causes him to be responsible for the utter ugliness of tragedy. Mr Henry Hewitt acted and spoke well. There was a startling touch of hardness in Mr Abraham Sofaer's correct picture of a business efficiency manager, in excellent contrast to the susceptible and vulgar advertising man offered by Mr Charles Mortimer. Mr Leo Baker was convincingly crude as a gullible and optimistic office boy, and Miss Marie Ault, Miss Esther Thomson, Mr Alfred Clark, and Mr Leyton Horniman excellent as the members of a poor class, self centred family. Mr Henry Hallett was amusing in a small part. The play produced by Mr Robert Atkins, had an enthusiastic reception. 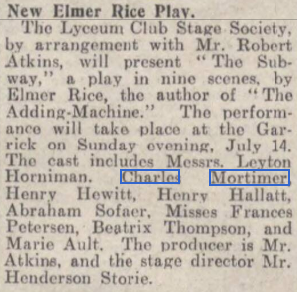 Charles Mortimer played Maxwell Hurst, in "The Subway", at the Garrick Theatre, London, on 14 July, 1929. 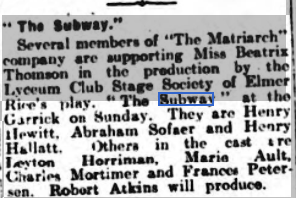 The play was presented by the Lyceum Club Stage Society and produced by Robert Atkins. This was a single performance.